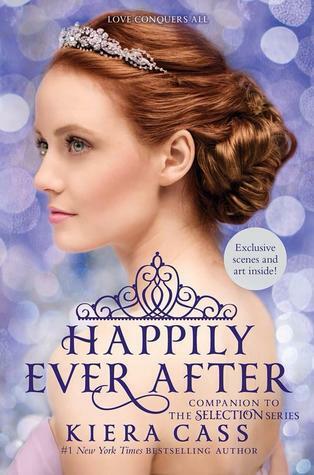 From true love and princes, to peasants and feuds, Happily Ever After is one of the many stunning and brilliant novels by Kiera Cass. This book goes behind the scenes and retells the most exciting and juicy scenes of Cass’s previous books in the Selection Series; The Selection, The Elite, and The One. In Happily Ever After there are about twenty-five chapters, and eight exciting sections contained in the pages of the book. One of the eight sections is The Queen, which describes how (former) Queen Amberly and King Clarkson fell in love. It is written from the point of view of Queen Amberly, and describes how they fell in love through the process of the Selection. The Selection is a tradition in the country of Illéa, and is the only chance for the heir to the throne to find their soulmate. The six other dazzling sections in Happily Ever After are The Favorite, Scenes From Celeste, The Prince,The Guard, The Maid, and After The One. They are all told in the perspective of a different character, telling each person’s secrets and unknown thoughts. Happily Ever After is a book that was published in the year 2015, and is 416 pages long. This is a suitable book for those who enjoy books that are not too long or short. It is appropriate for all ages interested in realistic fiction and fantasy with a hint of romance, and will sweep anybody away with its glowing ballrooms, lush gardens, and touching, happy, and sad moods. Other books that are suggested by Kiera Cass is The Heir and The Crown. Kiera Cass is New York’s bestselling author, and has transformed realistic fiction into a whole other genre. Forming the most marvelous book series; The Selection series, Kiera Cass has pulled together all of her abstract thoughts and put them into words.